ZIP Codes – Easy! 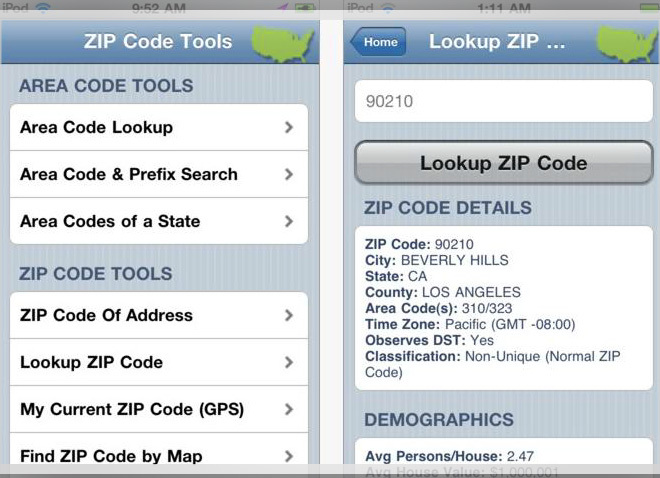 Lookup ZIP Code allows you to enter any ZIP Code to see information such as City, State, Area Code(s), and Time Zone. With each ZIP Code result, demographic details are provided. Some of the demographics included are Population, Average Persons/Household and Median Age per ZIP Code. What’s the ZIP Code of an Address? With the ZIP Code of Address feature, just type in an Address and it returns the full Standardized Address, 9-Digit ZIP Code and County. Where Am I, Right Now? Tap on My Current ZIP Code (GPS) to find out. 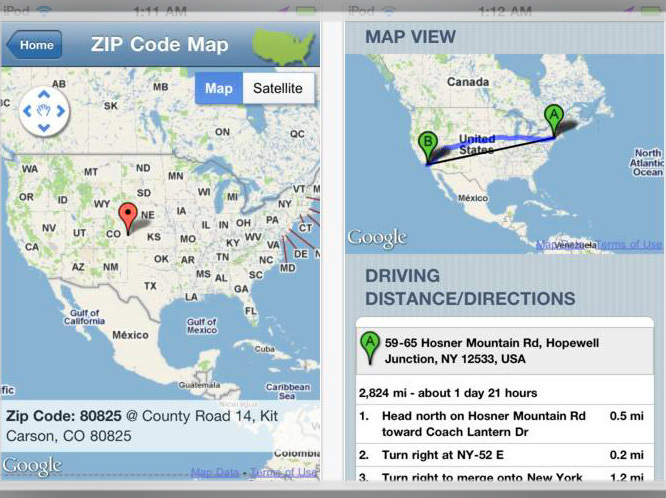 Find a ZIP Code with a Map Tap. When using Find ZIP Code by Map, Zoom in and out of a Google Map and tap the screen to see the ZIP Code anywhere in the United States. What ZIP Codes are Near By? If you’re searching for surrounding ZIP Codes from any area, tap ZIP Code Radius Finder to find all the ZIP Codes within 35 miles. ZIP Code Distance from A to B. If you need to find the distance between any two ZIP Codes, use the ZIP Code Distance Calculator. It calculates both driving and direct line-of-sight distance, complete with map and turn-by-turn directions. Need To Visit the Post Office? Tap on Locate a Post Office to find the one closest one from anywhere in the United States. How Do I Get There? Let ZIP Code Tools help you find your way. Check your Driving Distance and Directions by simply adding your starting and ending address. Where Is This Call From? You can find the location by tapping on Area Code Lookup, Area Code & Prefix Search or Area Codes of a State.